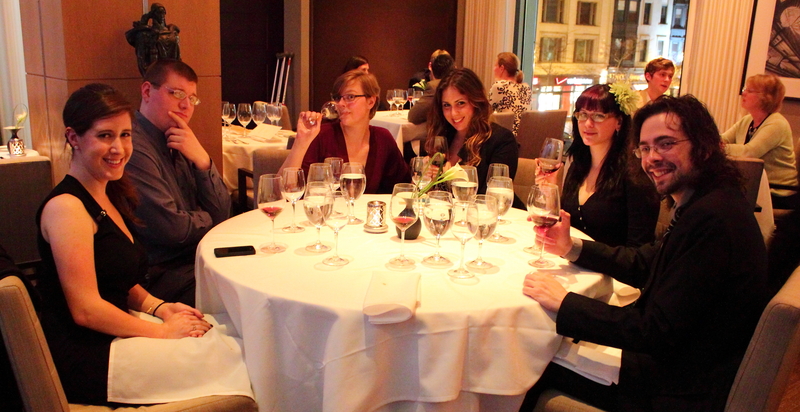 Boston’s Back Bay area transformed itself into Alsace, France for a splendorous and enchanting evening at L’Espalier. With the proper wines and Germanic dishes like Hay Roasted Rabbit with House Sausage, no tedious travel itineraries were necessary for this region unknown to me. 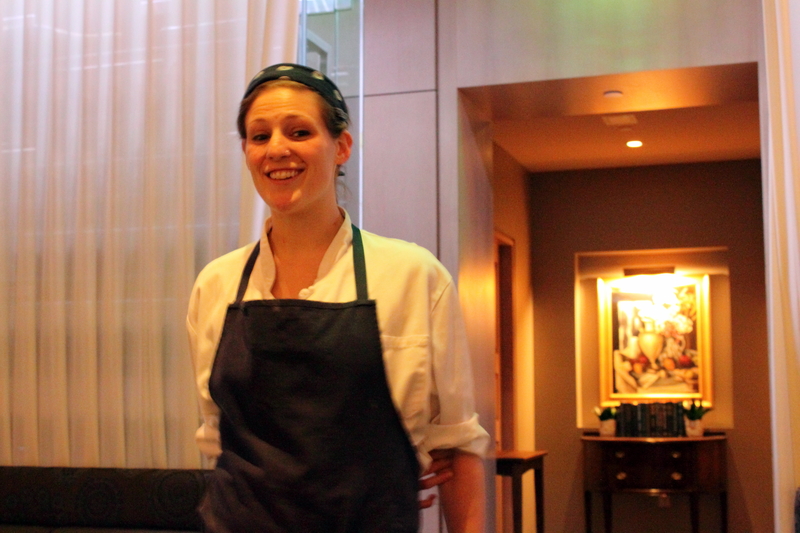 Nope, L’Espalier brought us on a delicious journey throughout the small but magnificent area of metropolitan France and boy oh boy, did it taste good. 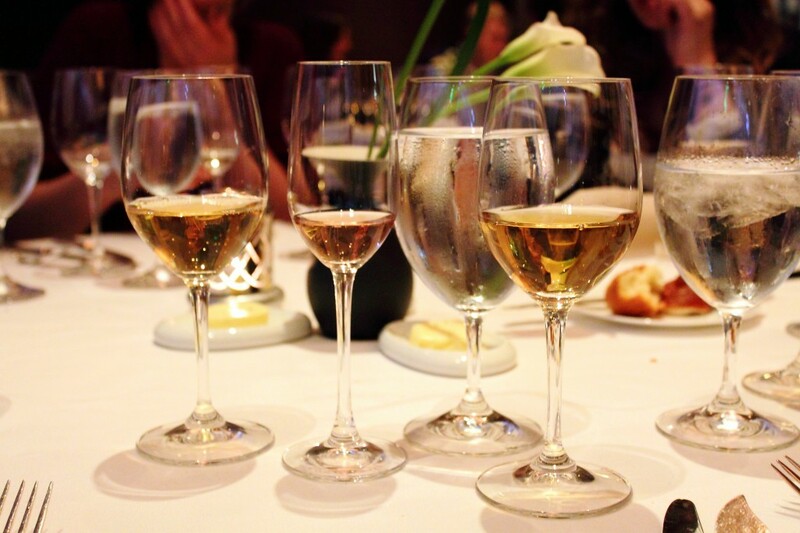 I was happily invited to the first Zagat Present dinner, “An Evening in Alsace at L’Espalier,” where chefs and sommeliers thoroughly explained five courses and wine pairings with expertise with interesting facts and entertaining humor. 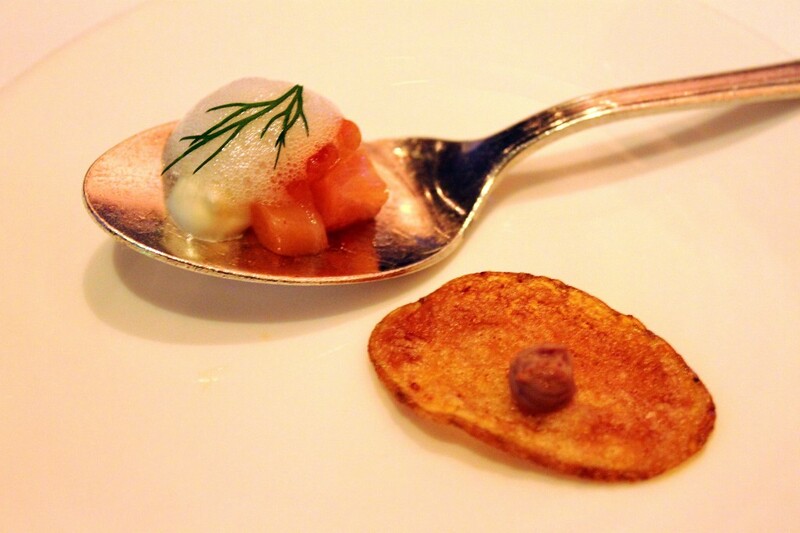 Before starting the dinner, we were treated with a delightful amuse-bouche with incredible flavor; salmon, roe, creme fraiche, and dill foam. On the side was a crispy chip with foie gras mousse. I love how the bright flavors of such a small bite can jolt your taste buds to life. 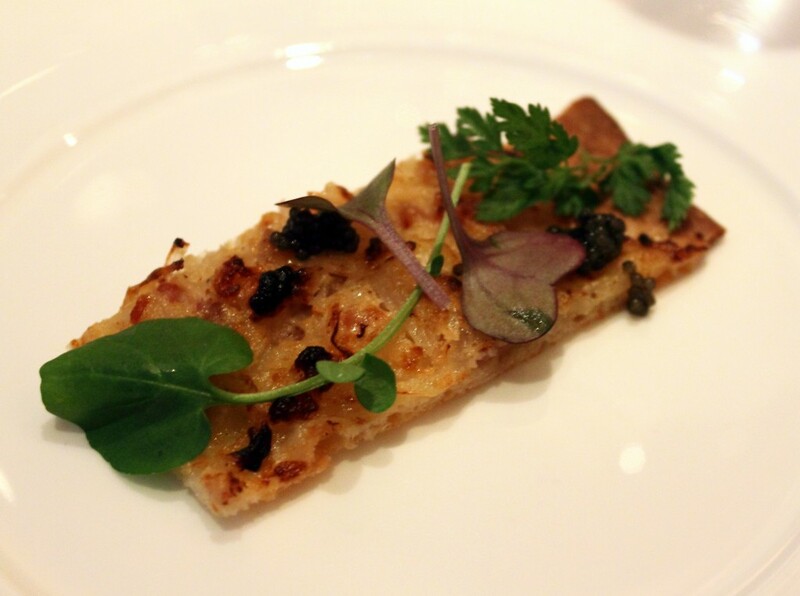 First was an hors d’oeuvre of Tarte Flambée with Caviar paired with Lucien Albrecht, Brut Rosé, Cremant d’Alsace. The subtle savoriness of the tarte with a hint of saltiness from the caviar was a great way to segue into the array of flavors that were soon to be experienced. 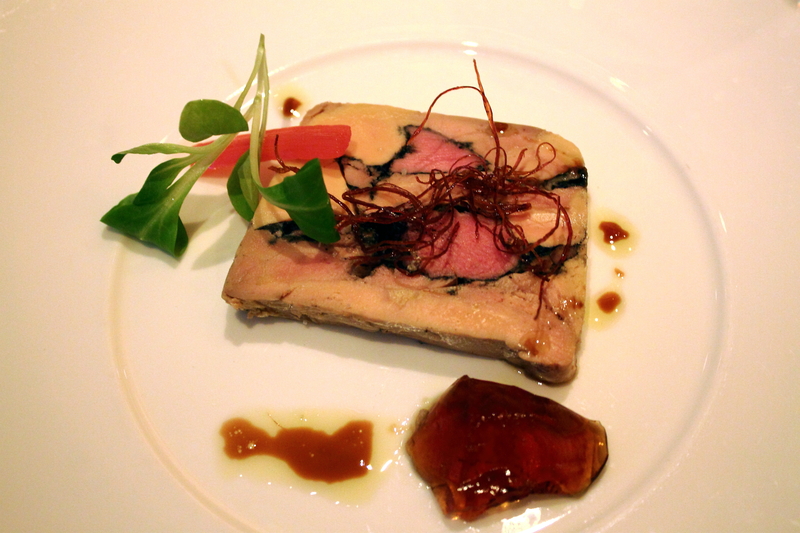 First course was a Hudson Valley foie gras terrine with ash-roasted duck, pickled rhubarb and consommé. Served with a fruit and nut bread, this was a fabulous variety of textures; smooth and chewy, rich and gamey. 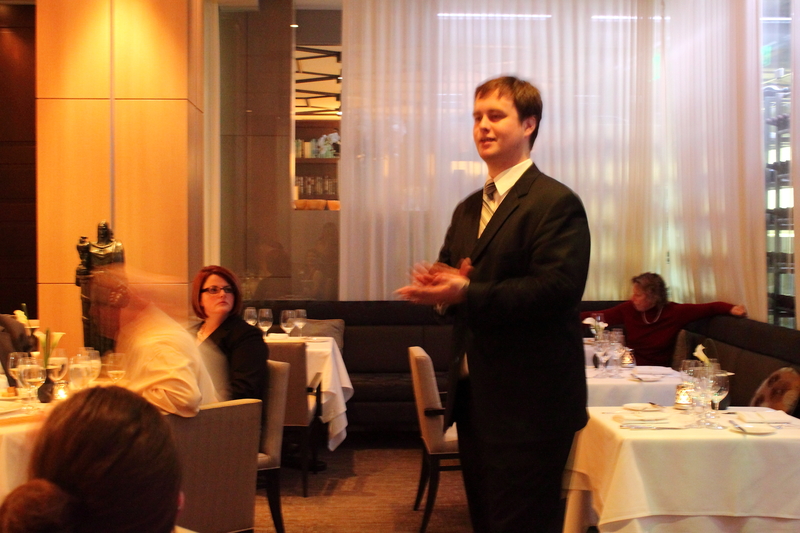 The diverse components made for a unique and interesting dish where the forethought of it is much appreciated. 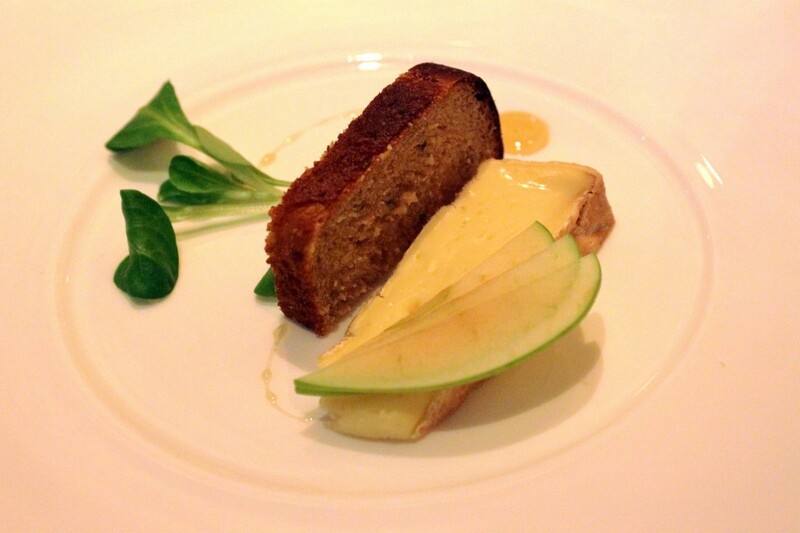 The foie gras terrine was paired with a 2008 Schoenheitz, “Linsenberg” Riesling. The second course was Georges Bank Cod with Lobster and Maine Crab Emulsion, served with White Asparagus and paired with a 2006 Zind Humbrecht, “Clos Hausere” Riesling. 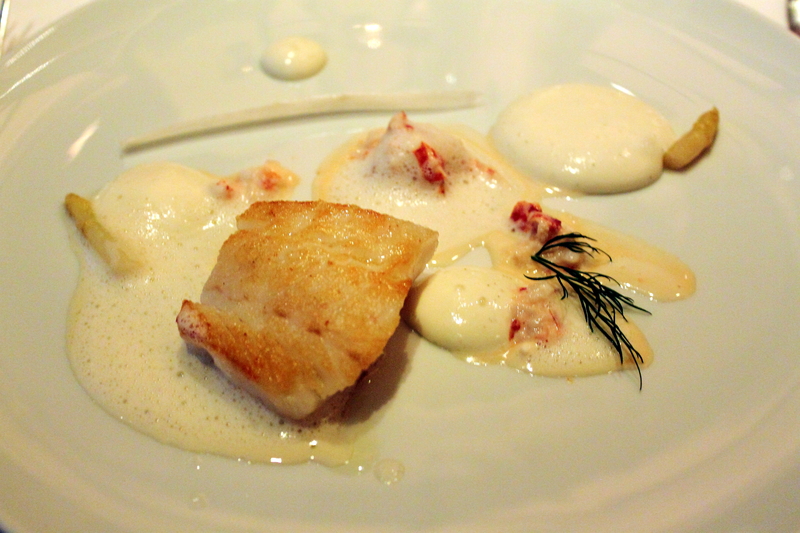 With a beautifully crispy sear, the cod was amazingly moist and tender and the lobster was very sweet. The light flavors of this seafood dish were balanced perfectly, matching the wonderfully soft and refined presentation. The visual appeal was just as lovely as the taste. 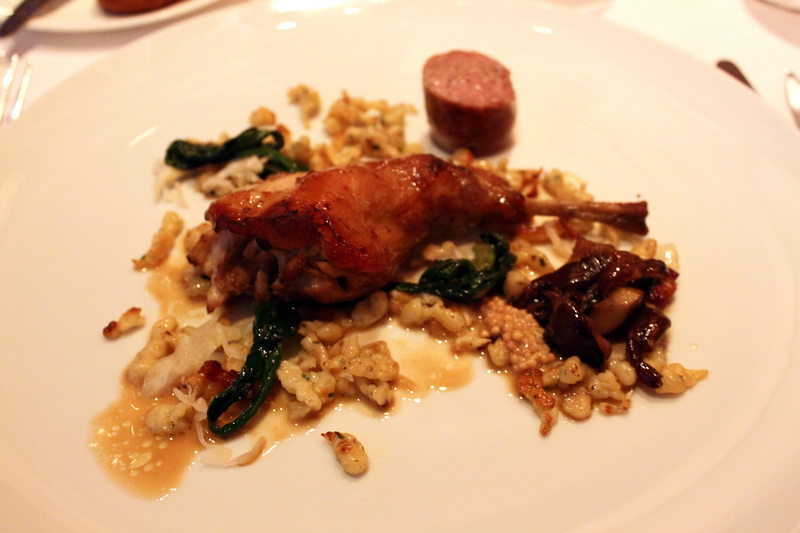 The third course was Hay Roasted Rabbit with House Sausage, Black Pepper Spaetzle, Foraged Mushrooms and Charred Ramps. This was paired with a 2005 F.E. Trimbach, “Reserve Personelle” Pinor Noir. 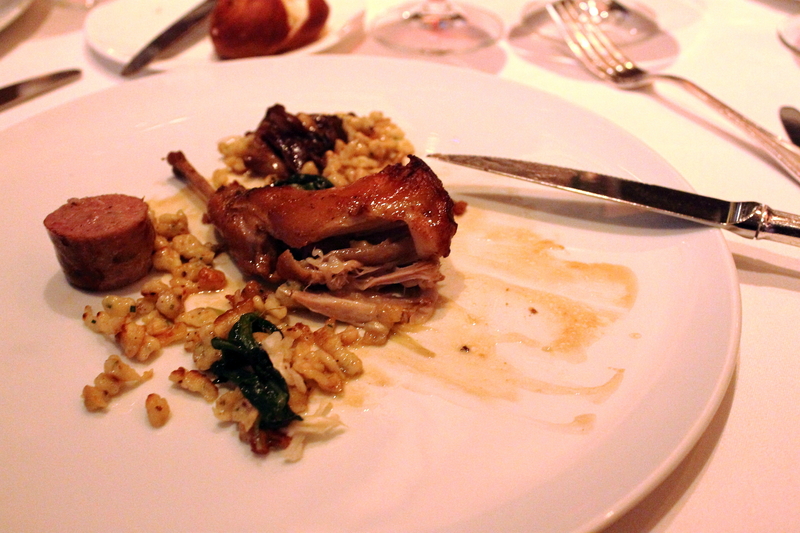 The tenderness of the rabbit was out of this world and the chewiness of the spaetzle was absolutely scrumptious. With the earthiness of the mushrooms? Forget about it! This hearty dish was definitely one of my favorites. I would love to have this meal again on a cold evening with the same glass of Pinot Noir. And here is where we started the painful transition towards the end of the meal, with a very pungent and sharp Muenster that was paired with a 2009 Weinbach, Reserve Personnelle” Gewurztraminer. Served with a sweet bread and thinly sliced green apples, this is a cheese all stinky cheese lovers dream about. Against the soft texture is a rind that crackles upon biting. Yum! 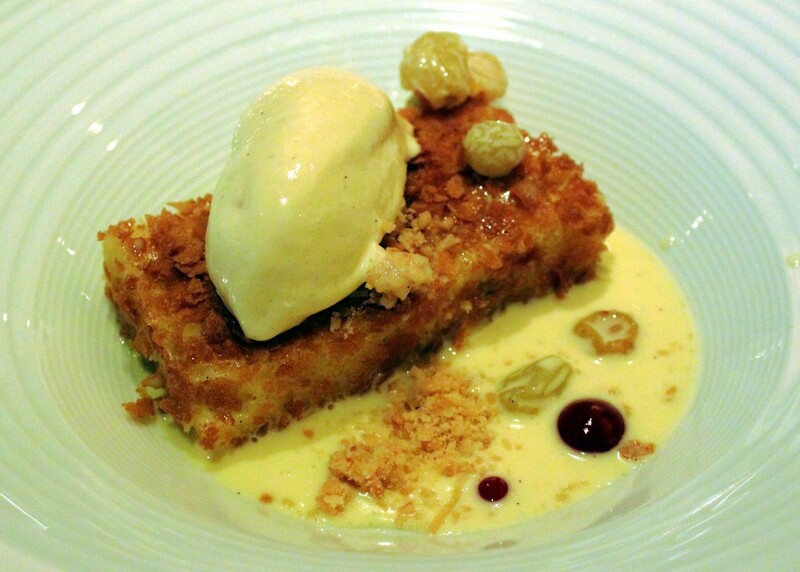 And last was the dessert; Kugelhopf Pain Perdu with Vanilla Ice Cream. De-li-cious. Fantastic! It is part cake part bread with a slight crunch on the outside and raisins soaked in various alcohols. With the simple and complex taste of smooth vanilla ice cream, the components of the dish complimented each other very well. 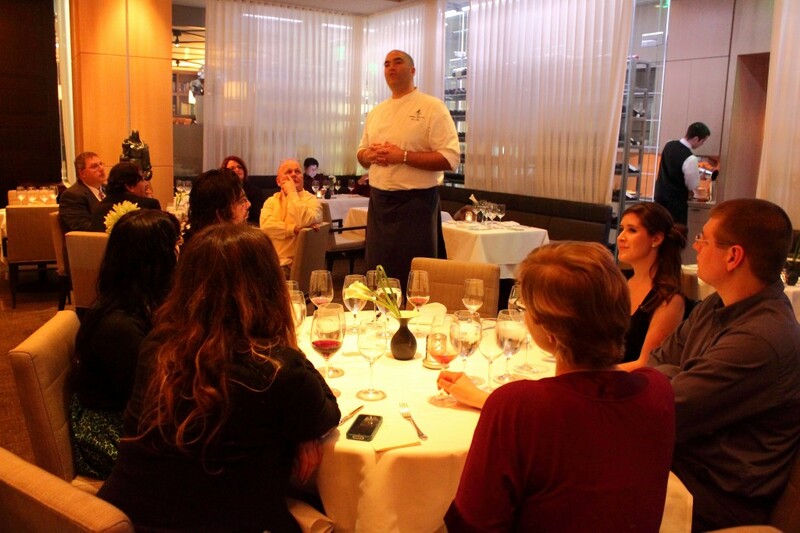 It is safe to say that Zagat Present’s “An Evening in Alsace” was a successful dinner that showcased unforgettably elegant Alsatian food and wine. 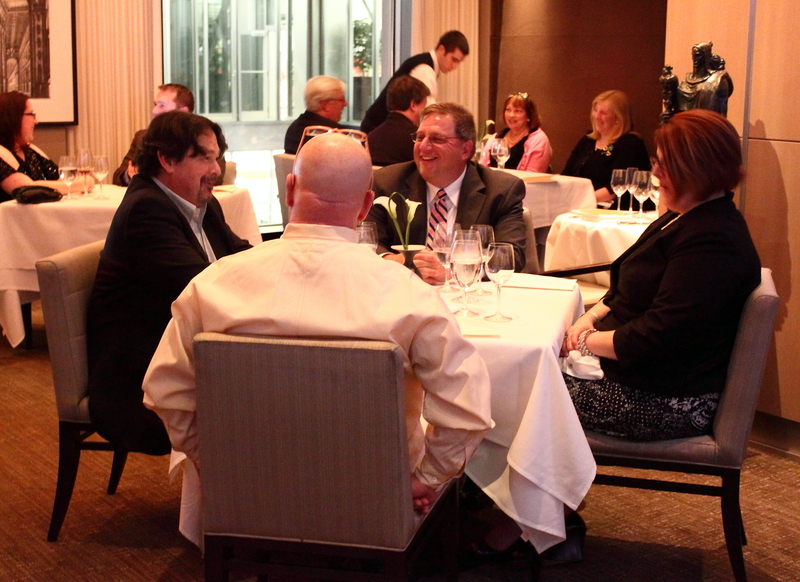 Thank you Zagat for this wonderful treat! It was lovely getting to know Alsace, France bite by delectable bite. I am very very jealous!